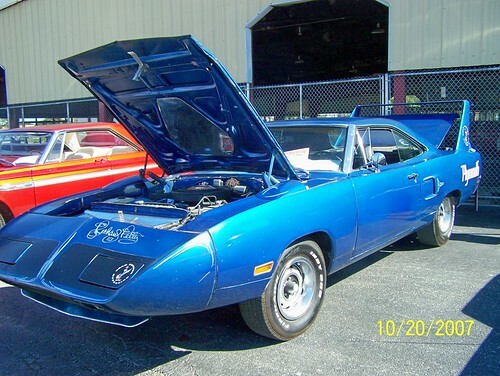 I am considering selling my 1970 Plymouth Superbird. I have owned the car since 2001. It was originally a lemon twist 440 4spd car, but the vinyl top was removed and was painted petty blue with advertisements on it and used as a pace car in Birmingham, Alabama. After it was retired from being a pace car, a new engine was installed in the car under warranty. The car was repainted in the early 90's and signed by Richard Petty. It shows its age but the car remains very close to original with only 50,000 original miles. Is there any market for these cars right now? What are they actually selling for? for 100,000 and he did a couple things and but it up for 140,000 it was nice nice 440 6 pack with less than 40,000 miles with the original 4 Barrel intake and breather in the trunk. was gone after a couple months nobody seems to know where it went. I have not talked with Peter myself. When dad phoned Peter and said you always said you would be interested in this car if i want to sell it I want $100,000 and the keystones don't go with it(dad died 5 weeks later) peter was there with a cashiers check in 2 hours! But the economy was hopping then that's Canadian dollars but is and was pretty much par. This car was used by the dealership as a pace car for a track outside Toronto for the first few years too then painted and sold that guy kept it till he died and his friend bought it and restored it adding the six pack Dad bought it off legendary (Shelby shop then) consignment for $35000 in about 1994/95. TheCarShop, Checking out the pic of your Superbird, is that car still looking pretty much like it did when that picture was taken? Just wondering, does that trunk lid lift up all the way? Good luck with whatever you decide to do. I bought my V code 4-speed for $75000 in 2002 and took it to get restored. It was in real good shape. After four years of being restored I picked it up and was offered $210,000 before I drove it a mile. I took it. However the market appears to be soft, and I could by the same 2-3 car for $70,000 and only get $180,000 as a #1. I have a better one I pick up (after a 8-ear restoration job) next week. V code, 4-speed, console, white buckets, B5. I would say the market is soft right now. It was good for me since I just purchased a 6 pack 4 speed. I never thought I would ever be able to get into a Wing car since prices sky rocketed in the last 12 - 15 years. Mine needs work, but am very happy with it!